Treat yourself to some of the best pizza in Boston on this walking food tour. Explore the city’s oldest neighborhoods and visit historic sites along the Freedom Trail like the house of Paul Revere. Your guide will bring history to life while along the walk. And you’ll enjoy some of Boston’s best slices at three pizzerias. You’ll never see pizza, or Boston, the same way after this fun, tasty and informative tour. There are more than hundreds of pizzerias in Boston, and 50 just in Little Italy, so it’s no surprise that you’ll find some of the best pizza in America in this city. Meet your pizza expert in Boston’s historic North End neighborhood for a tour that lets you taste gooey slices at three classic pizzerias and burn off the calories along the way. Just be sure to bring your appetite. You’ll still hear locals speaking Italian on the cobblestone streets of Little Italy. 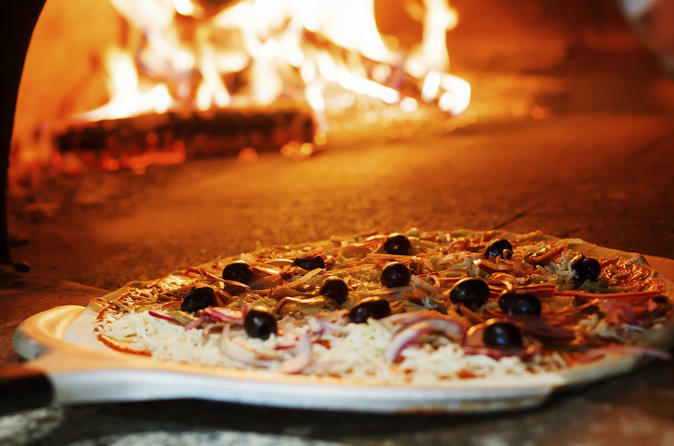 Savor a slice cooked in an oven built in 1883 at Boston’s oldest pizzeria, as well as ones from pizzerias named in the top 25 of Boston. Along the way you’ll walk through some of Boston’s historic neighborhoods, like Beacon Hill, the Blackstone Block, the North End (Little Italy) and Charlestown. Listen as your knowledgeable guide reveals illuminating bits of history in these areas, some of which were established over 300 years ago. Plus, you’ll trace the footsteps of America’s revolutionaries and visit historic landmarks such as Boston’s oldest standing church, the historic Paul Revere house and the city’s second-oldest burial ground. An informative guide and all of the food are included in this tour, so come hungry for pizza and an informative journey.